PhD. in Finance, Mangalore University, India, 2006. 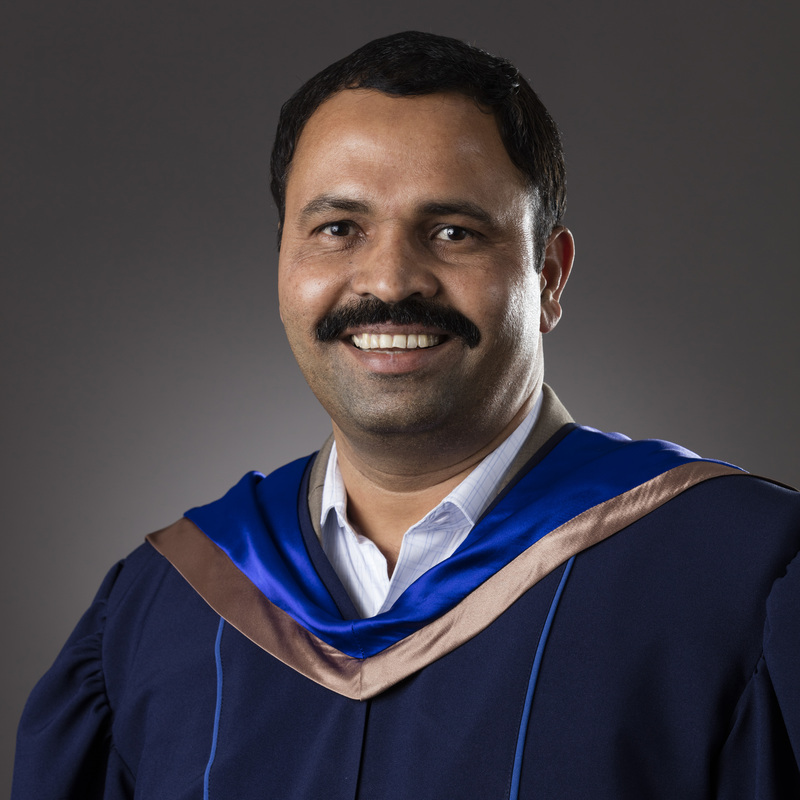 Master of Business Administration (MBA) with Finance Specialization, Sikkim Manipal University, India, 2010. Master of Commerce (M.Com.) with Accounting & Finance Specialization, Mangalore University, 1996. December 27, 2017: College of Business Administration, Kingdom University, Bahrain, Professor. November 3, 2011 - December 26, 2017: College of Business Administration, Kingdom University, Bahrain, Associate Professor. October 14, 2009 - November 2, 2011: College of Business Administration, Kingdom University, Bahrain, Assistant Professor. September 2006 to September 2009: Post-Graduate Department of Business Administration (MBA), P.A. College of Engineering, Mangalore, India, Professor of Finance. June 1999 to September 2006: D.M. College of Business Management, Mangalore, India, Assistant Professor. June 1996 to June 1999: Bhuvanendra College, Karkala, India, Lecturer. April 15, 2013: Director of Accreditation and Quality Assurance Centre. November 1, 2011, to April 14, 2013: Dean of College of Business Administration, Kingdom University, Bahrain. October 18, 2015, to March 2017: Chairman, Department of Accounting and Finance, College of Business Administration, Kingdom University, Bahrain. Naveen Kumar K.R., Iqbal Thonse Hawaldar and T. Mallikarjunappa (2018). “Windows of opportunity and seasoned equity offerings: An empirical study”. Cogent Economics and Finance, September, Vol. 6, No. 1 pp. 1-18. Publishing by Taylor and Francis. Indexed in Web of Science Emerging Sources Citation Index (ESCI), Scopus, International Bibliography of the Social Sciences (IBSS), Australian Business Deans Council (ABDC) Journal Quality List (B rating), 2018 ABS Journal Quality Guide. Rating: 1 (Economics, Econometrics and Statistics). DOI: https://doi.org/10.1080/23322039.2018.1528688. Iqbal Thonse Hawaldar, Abdelrhman Meero, Habeeb Ur Rahiman, and Rajesha T M. (2017). “Comparative Study of Income and Cost Efficiency of Islamic and Conventional Banks of Bahrain”, Asian Journal of Multidimensional Research journal (AJMR), September, Vol.6, No.9, pp. 105-117. Iqbal Thonse Hawaldar, Lokesh and Sheila Sison Biso (2016). “An Empirical Analysis of Financial Performance of Retail and Wholesale Islamic Banks in Bahrain”. American Scientific Research Journal for Engineering, Technology, and Sciences, July 2016, Vol. 20, No. 1, pp. 137-147, Indexed, listed, and abstracted in: Ulrich's, Massachusetts Institute of Technology, (MIT, USA), and many more. Iqbal Thonse Hawaldar, Prakash Pinto and Lokesh (2016). “An Empirical Analysis of Performance of Retail and Wholesale Conventional Banks in Bahrain”. British Journal of Economics, Finance and Management Sciences, June, Vol. 12, No. 1, pp. 1-10, Published by British Journals, UK. Iqbal Thonse Hawaldar (2016). “The Reaction of Bahrain Bourse to Announcement of Annual Financial Results”. International Review of Business Research Papers, Vol. 12, No. 1, March, 2016, pp.64-75. Indexed in Excellence in Research Australia (ERA), Australia. Iqbal Thonse Hawaldar (2015). “Empirical Testing of Capital Asset Pricing Model on Bahrain Bourse”. Asian Journal of Finance & Accounting, December, Vol. 7, No. 2, pp. 107-119. Published by Macro think Institute, USA Doi:10.5296/ajfa.v7i2.8356 URL: http://dx.doi.org/10.5296/ajfa.v7i2.8356, Indexed in Australian Business Deans Council (ABDC)'s Journals' Quality Rating List. .
Iqbal (2014). “Seasonal Analysis of Abnormal Returns after Quarterly Earnings Announcements”. International Journal of Accounting and Financial Reporting, Vol.4, No.2, December, pp. 501-519, Published by Macro think Institute, USA Doi:10.5296/ ijafr.v4i2.6622 URL: http://dx.doi.org/10.5296/ ijafr.v4i2.6622, Indexed in Australian Business Deans Council (ABDC)'s Journals' Quality Rating List. .
Josefina B. Salando and Iqbal (2013). “Relevance of Different Theories in Accounting”. Asian Journal of Research in Banking and Finance, Vol.3, No.1, January, pp.41-45. Mallikarjunappa T. and Iqbal T.H. (2013). “An Investigation of the Semi Strong Form of Stock Market Efficiency”, (ISBN: 978-81-924713-1-0) 10th Aims International Conference on Management, January 6-9, 2013 held at Indian Institute of Management, Bangalore, India, jointly organized by Indian Institute of Management (IIM), Bangalore and AIMS International, USA, pp. 1588-1596. Iqbal (2011). “Relevance of Capital Asset Pricing Model – A Review”, Journal on Banking Financial Services and Insurance Research, May, Vol. 1, No.2, pp.85-97. Iqbal and Nympha R Joseph (2011). “A Comparative Study of Service Quality of Conventional and Interactive Banking”. Journal on Banking Financial Services and Insurance Research, Vol. 1, No.2, May, pp. 1-15. Iqbal and Nympha R Joseph (2011). “Gap Analysis of Service Quality Among Banks”, International Journal of Research in Computer Application and Management, Vol. 1, No.3, May, pp. 9-15. Iqbal and T. Mallikarjunappa (2010). “A Study of Efficiency of the Indian Stock Market”, Indian Journal of Finance, Vol. 4, No. 5, May, pp.32-38. Indexed in SCOPUS (Elsevier). Iqbal and T. Mallikarjunappa (2009). “Indian Stock Market Reaction to the Quarterly Earnings Information”, Indian Journal of Finance, Vol.3, No.7, July, pp.43-50. Indexed in SCOPUS (Elsevier). Iqbal and T. Mallikarjunappa (2008). “Quarterly Earnings Information, Stock Returns and Stock Market Efficiency: An Empirical Study” Gyan Management, Vol. 2, No. 2, December, pp. 37-52. Iqbal and T. Mallikarjunappa (2008). “The Behaviour of Indian Stock Prices and Returns: Is the Stock Market Efficient? Scour, Vol.2, No.2, July, pp.39-46. Iqbal and T. Mallikarjunappa (2008). “An Empirical Testing of Semi-Strong Form Efficiency of Indian Stock Market”. Amity Business Review, January, pp.24–33. Iqbal, T. Mallikarjunappa, and Panduranga Nayak (2007). “Stock Price Adjustments to Quarterly Earnings Announcement: A Test of Semi-Strong Form of Efficiency” Gyan Management, Vol. 1, No.2, June, pp.25 - 42. Iqbal and T. Mallikarjunappa (2007). “An Empirical Investigation of the Adjustment of Stock Prices to Earnings Information” ACRM Journal, Vol.2, No.1, March, pp. 10-15. Iqbal and T. Mallikarjunappa (2003). “Stock Price Reactions to Earnings Announcements” Journal of IAMD and IUCBER, Vol.26, No.1, June, pp. 53-60. Application of Lev & Schwartz Compensation Model: A Study of Mangalore Chemicals & Fertilizers Limited, India.